1720: during a visit to Hamburg, Johann Sebastian Bach regales one of the great organists of the era, Johann Adam Reincken, with a lengthy, improvised Chorale Fantasia, exhausting every affordance the organ had to offer two hands and feet, stops and keyboards, gesture and rhetoric–a pyrotechnic display of Baroque cybernetics. HYPERORGAN asks the question: How can one use digital sampling technology to improvise a new 21st-century organ Fantasia using the gestures and techniques of contemporary spectral composition? This 60-minute solo album answers this question by deconstructing the affordances of a Baroque organ through a series of spectral extemporizations. As performer and composer, I will construct a new “hyperorgan” cybernetics, a new field of possibilities for artistic expression at the juncture of the old and the new, acoustic and digital, pitch and noise. HYPERORGAN will be recorded on the Cornell Baroque Organ in Cornell University’s Anabel Taylor Chapel in Summer, 2018. Built strictly using material techniques of the 17th-century, this astonishing instrument embodies the sounds, aesthetic, and affordances of the Baroque. Compared with modern organs built using modern means and materials, its mechanical stop action and meticulous pipe voicing possess an unsurpassed spectrum of sound possibilities, every key and stop presenting an artist with a rich palette of sound from whispy wind, shifting clouds of whistling tones, and microtonal pitch bends, to full pipe tone. Rather than play the instrument in the Baroque manner, pulling out stops fully and playing notes on the keyboards in the manner of Bach, I will exhaust the instrument’s capabilities for microtonal shaping and liminal pitch play by partially drawing stops and limiting the wind supply to pipes to modulate tones and clouds of sound. Through this process, the organ becomes a massive, acoustic sound generator for spectral improvisation. Along with deconstructing traditional Baroque organ playing techniques, I will utilize live digital sampling to add a new “hyper-acoustic” cybernetic dimension. Placing microphones throughout the organ case, I will sample, loop and modulate, on the fly, the liminal and microtonal colors I evoke from the instrument, composing a 21st-century Fantasia of complex layered clouds of sound. This album will demonstrate new hyper-acoustic techniques for playing the organ, exhibit the artistry of spectral improvisation, and offer an artistic deconstruction of the sound world and cybernetics of the Baroque pipe organ. The cybernetic, ecological, and aesthetic dimensions of the project will be documented and form the basis of subsequent presentation as Artistic Research. The most comprehensive single recording ever produced of contemporary American organ music, ORGANON NOVUS is a three-disc anthology featuring twenty-five works by major American composers from the past twenty-five years, including twenty world premiere recordings. ORGANON NOVUS was awarded a New Music USA Project grant and a Recording Grant from the Aaron Copland Fund for Music, the first organ recording to be awarded either of these highly competitive national grants. Recorded on the historic Skinner organ in Rockefeller Chapel at the University of Chicago. The world's first complete organ transcription of the legendary Études d'exécution transcendante by Franz Liszt, raising the bar for virtuoso organ technique. The album also includes two transcriptions from Liszt's Paganini Etudes, La Campanella and Arpeggio. 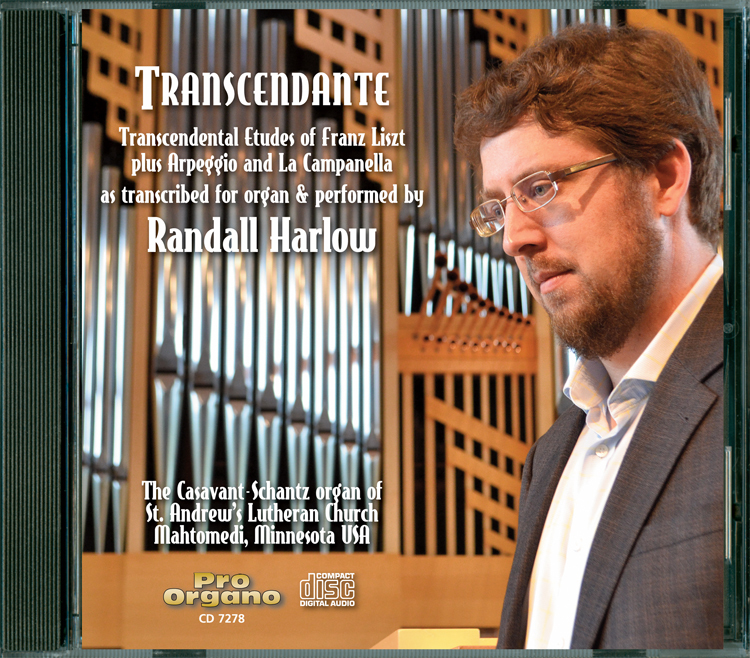 Recorded on the historic 1927 Casavant organ at St. Andrew's Lutheran Church in Mahtomedi, Minnesota.